1. A sacroiliac joint fusion system comprising: a) a joint implant comprising an electrode and a body including a distal end and a proximal end opposite the distal end, the electrode supported on the implant, wherein the electrode is located at a distal-inferior corner of the joint implant, the distal-inferior corner being defined at an intersection of a distal end surface and an inferior surface, the inferior surface extending between the proximal end and the distal end surface; b) a delivery tool comprising an implant arm with a distal end configured to releasably couple to the proximal end of the body of the joint implant; c) a nerve stimulating system configured to sense nerve proximity with the electrode; and d) an electrical conductor pathway extending from the electrode along the implant and implant arm to the nerve stimulating system, the electrical conductor pathway placing the electrode and nerve stimulating system in electrical communication. 2. The system of claim 1, wherein the proximal end of the implant and the distal end of the implant arm include a cooperatively mating electrical connection that forms a segment of the electrical conductor pathway. 3. The system of claim 2, wherein the cooperatively mating electrical connection includes male-female pin contact assembly. 4. The system of claim 1, wherein the electrode is at or near the distal end of the body of the joint implant, the body of the joint implant further comprising an electrically insulative coating or being formed of an electrically nonconductive material. 5. A sacroiliac joint navigation and implant system configured to provide functional surgical guidance to an operator during a sacroiliac joint fusion procedure on a patient having a sacroiliac joint comprising a sacrum and an ilium, the system comprising: a) a joint implant comprising an electrode and a body including a distal end and a proximal end opposite the distal end, the electrode supported on the implant; b) a delivery tool comprising an implant arm including a distal end configured to releasably couple to the body of the joint implant; c) a controller unit configured to cause the electrode to emit a predetermined amount of energy; d) a data acquisition system comprising a second electrode, signal conditioning circuitry and a processing unit wherein the data acquisition system is configured to receive energy via the second electrode, convert physical parameters caused by the electrode to an electrical signal operable to enable the processing unit to process the signal to provide data comprising a relative location of the implant; e) a first electrical conductor pathway extending from the electrode along the joint implant and implant arm to the controller unit, the first electrical conductor pathway placing the electrode and controller unit in electrical communication; and f) a second electrical conductor pathway extending from the second electrode to the data acquisition system, the second electrical conductor pathway placing the second electrode, the signal conditioning circuitry, and the processing unit in electrical communication with one another, wherein the system is configured to transmit real-time functional guidance data to a surgical robot during the sacroiliac joint fusion procedure via at least one signal comprising a modulated parameter, the data being a result of signal conditioning and processing, the data comprising localization data being a correlate of the relative location of the implant, and wherein the energy emitted from the electrode is adjustable. 6. The system of claim 5, wherein the system further comprises an electromyograph. 7. The system of claim 5, wherein the electrode is displaceable relative to the implant body. 8. The system of claim 7, wherein the electrode is removable from the implant body. 9. The system of claim 5, wherein the electrode is affixed to the implant body such that it is not removable from the implant body after implantation. 10. The system of claim 5, wherein the controller unit is housed within the delivery tool. 11. The system of claim 5, wherein the controller unit is located in an operating suite and electrically coupled to the electrode via electrical conductors extending through the implant body and the implant arm of the delivery system to electrically couple to the controller unit via a cable extending proximally from the delivery system to the controller unit. 12. The system of claim 5, wherein the data comprises allothetic sourced state feedback of the electrode. 13. The system of claim 5, wherein the joint implant further comprises a length disposed between the distal and proximal ends; an inner portion of the joint implant; at least first, second, and third sides, each of the first, second, and third sides extending between the distal and proximal ends; each of the first, second, and third sides comprising a plurality of struts defining a pattern of openings extending between groups of multiple struts of the plurality of struts, the openings extending into the inner portion; wherein the first side is separated from the second side by a first junction, the second side is separated from the third side by a second junction, each the first and second junctions extending the length. 14. The system of claim 5, wherein the body of the joint implant and the distal end of the implant arm include a cooperatively mating electrical connection that forms a segment of the first electrical conductor pathway. 15. The system of claim 14, wherein the cooperatively mating electrical connection includes male-female pin contact assembly. 16. The system of claim 5, wherein the electrode is at or near the distal end of the body of the joint implant and the body includes an electrically insulative coating or is formed of an electrically nonconductive material. 17. The system of claim 5, wherein an area directly surrounding the electrode has an electrically insulative coating or is formed of an electrically nonconductive material so as to reduce certain current shunting. 18. The system of claim 5, wherein the data is a result of a signal comprising an electromyogram. 19. The system of claim 5, wherein the joint implant further comprises a length disposed between the distal and proximal ends; an inner portion of the joint implant; at least first and second sides, each of the first and second sides extending between the distal and proximal ends; each of the first and second sides comprising a plurality of struts defining a pattern of openings extending between groups of multiple struts of the plurality of struts, the openings extending into the inner portion; wherein the first side is separated from the second side by a first junction, the first junction extending the length. 20. The system of claim 19, wherein a cross section transverse to the length of the implant is substantially non-circular such that it comprises at least two prominent apices and wherein each apex is comprised of a first and second longitudinal strut each extending generally uninterrupted between the distal and proximal ends of the joint implant. 21. The system of claim 19, wherein a sequence of a plurality of struts comprises an alternating arrangement such that a first strut in the sequence is diagonal to a longitudinal axis of the joint implant, a second strut in the sequence is substantially perpendicular to the longitudinal axis of the joint implant, and a third strut in the sequence is diagonal to the longitudinal axis of the joint implant. 22. The system of claim 19, wherein the first side comprises a first pattern of openings and the second side comprises a second pattern of openings; the first pattern of openings separated from the second pattern of openings via the first junction. 23. The system of claim 22, wherein the second pattern of openings is generally a mirror image of the first pattern of openings. 24. The system of claim 23, wherein the first junction comprises a first longitudinal strut extending generally uninterrupted between the distal and proximal ends of the joint implant wherein the first longitudinal strut comprises a keel extending in an outwardly direction from the inner portion and separating the first pattern of openings from the second pattern of openings. 25. The system of claim 24, wherein the first and second pattern of openings are coaxial with each other. 26. The system of claim 19, wherein the inner portion of the implant comprises a lattice structure of material. 27. The system of claim 19, wherein the joint implant comprises a custom manufactured configuration including predetermined dimensions selected for a particular patient, the predetermined dimensions being a result of an interpretation of an imaging study of the patient. 28. The system of claim 19, wherein the distal end of the joint implant comprises a distal opening configured to receive tissue of the patient into the inner portion via the distal opening such that when the joint implant is advanced into the patient the distal opening allows for self-harvesting of the tissue into the inner portion. 29. The system of claim 28, wherein a perimeter of the distal opening comprises an at least first side and second side, the first side arranged at an angle to the second side and the first side connected to the second side at a perimeter corner, wherein the first junction while extending the length generally terminates at the perimeter corner. 30. A sacroiliac joint navigation and implant system configured to provide functional surgical guidance to an operator during a sacroiliac joint fusion procedure on a patient having a sacroiliac joint comprising a sacrum and an ilium, the system comprising: a) a joint implant comprising an electrode and a body including a distal end and a proximal end opposite the distal end, the electrode supported on the implant; b) a delivery tool comprising an implant arm including a distal end configured to releasably couple to the body of the joint implant; c) a controller unit configured to cause the electrode to emit a predetermined amount of energy; d) a data acquisition system comprising a second electrode, signal conditioning circuitry and a processing unit wherein the data acquisition system is configured to receive energy via the second electrode, convert physical parameters caused by the electrode to an electrical signal operable to enable the processing unit to process the signal to provide data comprising a relative location of the implant; e) a first electrical conductor pathway extending from the electrode along the joint implant and implant arm to the controller unit, the first electrical conductor pathway placing the electrode and controller unit in electrical communication; and f) a second electrical conductor pathway extending from the second electrode to the data acquisition system, the second electrical conductor pathway placing the second electrode, the signal conditioning circuitry, and the processing unit in electrical communication with one another, wherein the system is configured to transmit real-time functional guidance data to a surgical robot during the sacroiliac joint fusion procedure via at least one signal comprising a modulated parameter, the data being a result of signal conditioning and processing, the data comprising localization data being a correlate of the relative location of the implant, and wherein a parameter of the energy emitted from the electrode is adjustable. 31. The system of claim 30, wherein the parameter comprises amperage. 32. The system of claim 31, wherein a first stimulus intensity is employed for navigation and a second stimulus intensity is employed for final positioning of the implant, the first stimulus intensity is different than the second stimulus intensity, wherein at least one of the first and second stimuli intensities is about 8 milliamperes. 33. The system of claim 30, wherein the parameter comprises amperage and a current of the amperage is about 8 milliamperes. 34. A sacroiliac joint navigation and implant system configured to provide functional surgical guidance to an operator during a sacroiliac joint fusion procedure on a patient having a sacroiliac joint comprising a sacrum and an ilium, the system comprising: a) a joint implant comprising an electrode and a body including a distal end and a proximal end opposite the distal end, the electrode supported on the implant; b) a delivery tool comprising an implant arm including a distal end configured to releasably couple to the body of the joint implant; c) a controller unit configured to cause the electrode to emit a predetermined amount of energy; d) a data acquisition system comprising a second electrode, signal conditioning circuitry and a processing unit wherein the data acquisition system is configured to receive energy via the second electrode, convert physical parameters caused by the electrode to an electrical signal operable to enable the processing unit to process the signal to provide data comprising a relative location of the implant; e) a first electrical conductor pathway extending from the electrode along the joint implant and implant arm to the controller unit, the first electrical conductor pathway placing the electrode and controller unit in electrical communication; and f) a second electrical conductor pathway extending from the second electrode to the data acquisition system, the second electrical conductor pathway placing the second electrode, the signal conditioning circuitry, and the processing unit in electrical communication with one another, wherein the system is configured to transmit real-time functional guidance data to a surgical robot during the sacroiliac joint fusion procedure via at least one signal comprising a modulated parameter, the data being a result of signal conditioning and processing, the data comprising localization data being a correlate of the relative location of the implant, wherein the data comprises allothetic sourced state feedback of the electrode, and wherein the delivery tool further comprises an anchor arm configured to be coupled to the implant arm resulting in an arrangement providing an idiothetic relational mapping source such that a member is deliverable to a sacroiliac joint region via the anchor arm into a position relative to a location of the joint implant. 35. The system of claim 34, wherein a third electrode is located within, near, or on the member. 36. The system of claim 35, wherein a fourth electrode is located within, near, or on a probe, trial, broach, or drill. 37. The system of claim 36, wherein the second electrode is a surface electrode configured to be applied to skin of the patient. 38. The system of claim 36, wherein the second electrode is an intramuscular electrode configured to be positioned within at least one of a quadriceps femoris, tibialis anterior, gastrocnemius, or abductor hallucis muscle of the patient. 39. The system of claim 34, wherein the system comprises multiple preselected trajectories for guidance of the member relative to the joint implant, the preselected trajectories being a result of imaging studies of the patient. 40. The system of claim 34, wherein the energy emitted from the electrode is adjustable. 41. The system of claim 34, wherein a first stimulus intensity is employed for navigation and a second stimulus intensity is employed for final positioning of the implant, and wherein the first stimulus intensity is different than the second stimulus intensity. 42. The system of claim 34, wherein the system further comprises an electromyograph. 43. The system of claim 34, wherein the electrode is displaceable relative to the implant body. 44. The system of claim 43, wherein the electrode is removable from the implant body. 45. The system of claim 34, wherein the electrode is affixed to the implant body such that it is not removable from the implant body after implantation. 46. The system of claim 34, wherein the data is a result of a signal comprising an electromyogram. 47. The system of claim 34, wherein the joint implant further comprises a length disposed between the distal and proximal ends; an inner portion of the joint implant; at least first and second sides, each of the first and second sides extending between the distal and proximal ends; each of the first and second sides comprising a plurality of struts defining a pattern of openings extending between groups of multiple struts of the plurality of struts, the openings extending into the inner portion; wherein the first side is separated from the second side by a first junction, the first junction extending the length. 48. The system of claim 47, wherein a cross section transverse to the length of the implant is substantially non-circular such that it comprises at least two prominent apices and wherein each apex is comprised of a first and second longitudinal strut each extending generally uninterrupted between the distal and proximal ends of the joint implant. 49. The system of claim 47, wherein a sequence of a plurality of struts comprises an alternating arrangement such that a first strut in the sequence is diagonal to a longitudinal axis of the joint implant, a second strut in the sequence is substantially perpendicular to the longitudinal axis of the joint implant, and a third strut in the sequence is diagonal to the longitudinal axis of the joint implant. 50. The system of claim 47, wherein the first side comprises a first pattern of openings and the second side comprises a second pattern of openings; the first pattern of openings separated from the second pattern of openings via the first junction. 51. The system of claim 50, wherein the second pattern of openings is generally a mirror image of the first pattern of openings. 52. The system of claim 51, wherein the first junction comprises a first longitudinal strut extending generally uninterrupted between the distal and proximal ends of the joint implant wherein the first longitudinal strut comprises a keel extending in an outwardly direction from the inner portion and separating the first pattern of openings from the second pattern of openings. 53. The system of claim 52, wherein the first and second pattern of openings are coaxial with each other. 54. The system of claim 34, wherein the member is at least one of: a) a tool; b) a biocompatible material; c) an anchor; d) an elongated body; e) a nail; f) a rod; g) a pin; h) a threaded screw; i) an expanding body; or j) a cable. 55. The system of claim 34, wherein the system is configured to guide the delivery of the member though an opening of the joint implant via the anchor arm. 56. The system of claim 34, wherein the system is configured to guide the delivery of the member adjacent the implant via the anchor arm. 57. A sacroiliac joint navigation and implant system configured to provide functional surgical guidance to an operator during a sacroiliac joint fusion procedure on a patient having a sacroiliac joint comprising a sacrum and an ilium, the system comprising: a) a joint implant comprising an electrode and a body including a distal end and a proximal end opposite the distal end, the electrode supported on the implant; b) a delivery tool comprising an implant arm including a distal end configured to releasably couple to the body of the joint implant; c) a controller unit configured to cause the electrode to emit a predetermined amount of energy; d) a data acquisition system comprising a second electrode, signal conditioning circuitry and a processing unit wherein the data acquisition system is configured to receive energy via the second electrode, convert physical parameters caused by the electrode to an electrical signal operable to enable the processing unit to process the signal to provide data comprising a relative location of the implant; e) a first electrical conductor pathway extending from the electrode along the joint implant and implant arm to the controller unit, the first electrical conductor pathway placing the electrode and controller unit in electrical communication; and f) a second electrical conductor pathway extending from the second electrode to the data acquisition system, the second electrical conductor pathway placing the second electrode, the signal conditioning circuitry, and the processing unit in electrical communication with one another, wherein the electrode is located at a distal-inferior corner of the joint implant, the distal-inferior corner being defined at an intersection of a distal end surface and an inferior surface, the inferior surface extending between the proximal end and the distal end surface. 58. The system of claim 57, wherein the distal-inferior corner generally anatomically mimics a curvature of a boundary defining at least one of the sacrum or the ilium. 59. The system of claim 57, wherein the energy emitted from the electrode is adjustable. 60. The system of claim 57, wherein an area directly surrounding the electrode has an electrically insulative coating or is formed of an electrically nonconductive material so as to reduce certain current shunting. 61. The system of claim 57, wherein a first stimulus intensity is employed for navigation and a second stimulus intensity is employed for final positioning of the implant, and wherein the first stimulus intensity is different than the second stimulus intensity. 62. The system of claim 57, wherein the electrode is displaceable relative to the implant body. 63. The system of claim 62, wherein the electrode is removable from the implant body. 64. The system of claim 57, wherein the electrode is affixed to the implant body such that it is not removable from the implant body after implantation. 65. The system of claim 57, wherein the system is configured to transmit real-time functional guidance data to a surgical robot during the sacroiliac joint fusion procedure via at least one signal comprising a modulated parameter, the data being a result of signal conditioning and processing, the data comprising localization data being a correlate of the relative location of the implant. 66. The system of claim 65, wherein the data comprises allothetic sourced state feedback of the electrode, and wherein the delivery tool further comprises an anchor arm configured to be coupled to the implant arm resulting in an arrangement providing an idiothetic relational mapping source such that a member is deliverable to a sacroiliac joint region via the anchor arm into a position relative to a location of the joint implant. 67. The system of claim 57, wherein the delivery tool further comprises an anchor arm configured to be coupled to the implant arm resulting in an arrangement such that a member is deliverable to a sacroiliac joint region via the anchor arm into a position relative to a location of the joint implant. 68. The system of claim 67, wherein the member is at least one of: a) a tool; b) a biocompatible material; c) an anchor; d) an elongated body; e) a nail; f) a rod; g) a pin; h) a threaded screw; i) an expanding body; or j) a cable. 69. The system of claim 67, wherein the system is configured to guide the delivery of the member though an opening of the joint implant via the anchor arm. 70. The system of claim 67, wherein the system is configured to guide the delivery of the member adjacent the implant via the anchor arm. 71. The system of claim 57, wherein the joint implant further comprises a length disposed between the distal and proximal ends; an inner portion of the joint implant; at least first and second sides, each of the first and second sides extending between the distal and proximal ends; each of the first and second sides comprising a plurality of struts defining a pattern of openings extending between groups of multiple struts of the plurality of struts, the openings extending into the inner portion; wherein the first side is separated from the second side by a first junction, the first junction extending the length. 72. A sacroiliac joint navigation and implant system configured to provide functional surgical guidance to an operator during a sacroiliac joint fusion procedure on a patient having a sacroiliac joint comprising a sacrum and an ilium, the system comprising: a) a joint implant comprising an electrode and a body including a distal end and a proximal end opposite the distal end, the electrode supported on the implant; b) a delivery tool comprising an implant arm including a distal end configured to releasably couple to the body of the joint implant; c) a controller unit configured to cause the electrode to emit a predetermined amount of energy; d) a data acquisition system comprising a second electrode, signal conditioning circuitry and a processing unit wherein the data acquisition system is configured to receive energy via the second electrode, convert physical parameters caused by the electrode to an electrical signal operable to enable the processing unit to process the signal to provide data comprising a relative location of the implant; e) a first electrical conductor pathway extending from the electrode along the joint implant and implant arm to the controller unit, the first electrical conductor pathway placing the electrode and controller unit in electrical communication; and f) a second electrical conductor pathway extending from the second electrode to the data acquisition system, the second electrical conductor pathway placing the second electrode, the signal conditioning circuitry, and the processing unit in electrical communication with one another, wherein an inferior side of the joint implant extends between the proximal and distal ends and the distal end comprises a distal-inferior corner defining an intersection of the distal end and the inferior side, wherein a radiopaque marker is positioned near the distal-inferior corner and is configured to assist in surgical navigation. 73. The system of claim 72, wherein the energy emitted from the electrode is adjustable. 74. The system of claim 72, wherein an area directly surrounding the electrode has an electrically insulative coating or is formed of an electrically nonconductive material so as to reduce certain current shunting. 75. The system of claim 72, wherein a first stimulus intensity is employed for navigation and a second stimulus intensity is employed for final positioning of the implant, and wherein the first stimulus intensity is different than the second stimulus intensity. 76. The system of claim 72, wherein the electrode is displaceable relative to the implant body. 77. The system of claim 76, wherein the electrode is removable from the implant body. 78. The system of claim 72, wherein the electrode is affixed to the implant body such that it is not removable from the implant body after implantation. 79. The system of claim 72, wherein the system is configured to transmit real-time functional guidance data to a surgical robot during the sacroiliac joint fusion procedure via at least one signal comprising a modulated parameter, the data being a result of signal conditioning and processing, the data comprising localization data being a correlate of the relative location of the implant. 80. The system of claim 79, wherein the data comprises allothetic sourced state feedback of the electrode, and wherein the delivery tool further comprises an anchor arm configured to be coupled to the implant arm resulting in an arrangement providing an idiothetic relational mapping source such that a member is deliverable to a sacroiliac joint region via the anchor arm into a position relative to a location of the joint implant. 81. 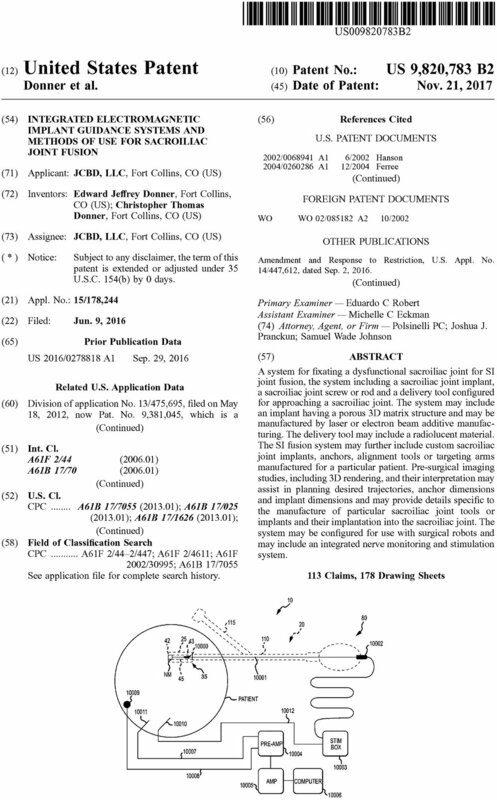 The system of claim 72, wherein the delivery tool further comprises an anchor arm configured to be coupled to the implant arm resulting in an arrangement such that a member is deliverable to a sacroiliac joint region via the anchor arm into a position relative to a location of the joint implant. 82. The system of claim 81, wherein the member is at least one of: a) a tool; b) a biocompatible material; c) an anchor; d) an elongated body; e) a nail; f) a rod; g) a pin; h) a threaded screw; i) an expanding body; or j) a cable. 83. The system of claim 81, wherein the system is configured to guide the delivery of the member though an opening of the joint implant via the anchor arm. 84. The system of claim 81, wherein the system is configured to guide the delivery of the member adjacent the implant via the anchor arm. 85. The system of claim 72, wherein the joint implant further comprises a length disposed between the distal and proximal ends; an inner portion of the joint implant; at least first and second sides, each of the first and second sides extending between the distal and proximal ends; each of the first and second sides comprising a plurality of struts defining a pattern of openings extending between groups of multiple struts of the plurality of struts, the openings extending into the inner portion; wherein the first side is separated from the second side by a first junction, the first junction extending the length. 86. A sacroiliac joint navigation and implant system configured to provide functional surgical guidance to an operator during a sacroiliac joint fusion procedure on a patient having a sacroiliac joint comprising a sacrum and an ilium, the system comprising: a) a joint implant comprising an electrode and a body including a distal end and a proximal end opposite the distal end, the electrode supported on the implant; b) a delivery tool comprising an implant arm including a distal end configured to releasably couple to the body of the joint implant; c) a controller unit configured to cause the electrode to emit a predetermined amount of energy; d) a data acquisition system comprising a second electrode, signal conditioning circuitry and a processing unit wherein the data acquisition system is configured to receive energy via the second electrode, convert physical parameters caused by the electrode to an electrical signal operable to enable the processing unit to process the signal to provide data comprising a relative location of the implant; e) a first electrical conductor pathway extending from the electrode along the joint implant and implant arm to the controller unit, the first electrical conductor pathway placing the electrode and controller unit in electrical communication; and f) a second electrical conductor pathway extending from the second electrode to the data acquisition system, the second electrical conductor pathway placing the second electrode, the signal conditioning circuitry, and the processing unit in electrical communication with one another, wherein the joint implant further comprises a length disposed between the distal and proximal ends; an inner portion of the joint implant; at least first, second, and third sides, each of the first, second, and third sides extending between the distal and proximal ends; each of the first, second, and third sides comprising a plurality of struts defining a pattern of openings extending between groups of multiple struts of the plurality of struts, the openings extending into the inner portion; wherein the first side is separated from the second side by a first junction, the second side is separated from the third side by a second junction, each the first and second junctions extending the length, and wherein a cross section transverse to the length of the implant is substantially non-circular such that it comprises at least three prominent apices and wherein each apex is comprised of a first, second, and third longitudinal strut each extending generally uninterrupted between the distal and proximal ends of the joint implant. 87. The system of claim 86, wherein the first junction comprises the first longitudinal strut and the second junction comprises the second longitudinal strut. 88. The system of claim 87, wherein a plurality of struts zig-zag between the distal and proximal ends of the joint implant such that the plurality of struts define openings that are at least in part polygonal as defined by struts on either side of the openings. 89. The system of claim 87, wherein an opening perimeter of the openings is three dimensional. 90. The system of claim 89, wherein an implant exterior surface closely surrounding the opening perimeter comprises peaks and valleys relative to the inner portion of the implant. 91. The system of claim 89, wherein the opening perimeter comprises a non-Euclidean geometric shape. 92. The system of claim 91, wherein the opening perimeter comprises both hyperbolic and elliptic regions. 93. The system of claim 89, wherein the opening perimeter comprises at least three outwardly extending apices. 94. The system of claim 86, wherein a sequence of a plurality of struts comprises an alternating arrangement such that a first strut in the sequence is diagonal to a longitudinal axis of the joint implant, a second strut in the sequence is substantially perpendicular to the longitudinal axis of the joint implant, and a third strut in the sequence is diagonal to the longitudinal axis of the joint implant. 95. The system of claim 94, wherein the first side comprises a first pattern of openings, the second side comprises a second pattern of openings, and the third side comprises a third pattern of openings; the first pattern of openings separated from the second pattern of openings via the first longitudinal strut, and the second pattern of openings separated from the third pattern of openings via the second longitudinal strut. 96. The system of claim 95, wherein the second pattern of openings is generally a mirror image of the first pattern of openings, the third pattern of openings is generally a mirror image of the second pattern of openings. 97. The system of claim 96, wherein the first longitudinal strut comprises a keel extending in an outwardly direction from the inner portion and separating the first pattern of openings from the second pattern of openings, the second longitudinal strut comprises an inferior side of the implant separating the second pattern of openings from the third pattern of openings. 98. The system of claim 96, wherein each of the first, second, and third sides comprise a face, each face comprises a normal extending away from the inner portion of the implant, wherein each normal points in different directions such that the normals are non-parallel and divergent. 99. The system of claim 95, wherein the implant further comprises a fourth side extending between the distal and proximal ends, the fourth side comprising a plurality of struts defining a fourth pattern of openings extending between groups of multiple struts of the plurality of struts, the fourth pattern of openings extending into the inner portion, the fourth pattern of openings separated from the third pattern of openings via the third longitudinal strut defining a third junction and comprising a second keel. 100. The system of claim 99, wherein the implant further comprises a superior side extending between the distal and proximal ends, the superior side comprising an access opening extending into the inner portion, the access opening separated from the fourth pattern of openings via a fourth longitudinal strut defining a fourth junction and extending generally uninterrupted between the distal and proximal ends of the implant, the access opening separated from the first pattern of openings via a fifth longitudinal strut defining a fifth junction and extending generally uninterrupted between the distal and proximal ends of the implant, wherein the access opening comprises a perimeter which is substantially greater than any perimeter defining each opening on the first side. 101. The system of claim 86, wherein the distal end of the joint implant comprises a distal opening configured to receive tissue of the patient into the inner portion via the distal opening such that when the joint implant is advanced into the patient the distal opening allows for self-harvesting of the tissue into the inner portion. 102. The system of claim 101, wherein a perimeter of the distal opening comprises an at least first side and second side, the first side arranged at an angle to the second side and the first side connected to the second side at a perimeter corner, wherein the first longitudinal strut generally terminates at the perimeter corner while extending the between the distal and proximal ends of the joint implant. 103. The system of claim 86, wherein the energy emitted from the electrode is adjustable. 104. The system of claim 86, wherein an area directly surrounding the electrode has an electrically insulative coating or is formed of an electrically nonconductive material so as to reduce certain current shunting. 105. The system of claim 86, wherein a first stimulus intensity is employed for navigation and a second stimulus intensity is employed for final positioning of the implant, and wherein the first stimulus intensity is different than the second stimulus intensity. 106. The system of claim 105, wherein at least one of the first and second stimuli intensities is about 8 milliamperes. 107. The system of claim 86, wherein the system further comprises an electromyograph. 108. The system of claim 86, wherein the electrode is displaceable relative to the implant body. 109. The system of claim 108, wherein the electrode is removable from the implant body. 110. The system of claim 86, wherein the electrode is affixed to the implant body such that it is not removable from the implant body after implantation. 111. A sacroiliac joint navigation and implant system configured to provide functional surgical guidance to an operator during a sacroiliac joint fusion procedure on a patient having a sacroiliac joint comprising a sacrum and an ilium, the system comprising: a) a joint implant comprising an electrode and a body including a distal end and a proximal end opposite the distal end, the electrode supported on the implant; b) a delivery tool comprising an implant arm including a distal end configured to releasably couple to the body of the joint implant; c) a controller unit configured to cause the electrode to emit a predetermined amount of energy; d) a data acquisition system comprising a second electrode, signal conditioning circuitry and a processing unit wherein the data acquisition system is configured to receive energy via the second electrode, convert physical parameters caused by the electrode to an electrical signal operable to enable the processing unit to process the signal to provide data comprising a relative location of the implant; e) a first electrical conductor pathway extending from the electrode along the joint implant and implant arm to the controller unit, the first electrical conductor pathway placing the electrode and controller unit in electrical communication; and f) a second electrical conductor pathway extending from the second electrode to the data acquisition system, the second electrical conductor pathway placing the second electrode, the signal conditioning circuitry, and the processing unit in electrical communication with one another, wherein the joint implant further comprises a length disposed between the distal and proximal ends; an inner portion of the joint implant; at least first, second, and third sides, each of the first, second, and third sides extending between the distal and proximal ends; each of the first, second, and third sides comprising a plurality of struts defining a pattern of openings extending between groups of multiple struts of the plurality of struts, the openings extending into the inner portion; wherein the first side is separated from the second side by a first junction, the second side is separated from the third side by a second junction, each the first and second junctions extending the length, wherein the implant further comprises a first junction having a first longitudinal strut and a second junction having a second longitudinal strut, each of the first and second longitudinal struts extending generally uninterrupted and generally parallel to each other along the length, wherein the plurality of struts defining a pattern of openings through the second side comprises a strut arrangement spaced along the length of the implant comprising different strut angles relative to a longitudinal axis of the first longitudinal strut and a longitudinal axis of the second longitudinal strut, wherein a sequence of openings of the pattern of openings comprises openings being at least in part polygonal in shape and wherein a first side of a first opening comprising the sequence is generally linear, parallel and adjacent the second longitudinal strut, the first side comprising a distal end and a proximal end, the distal end comprising a first strut and the proximal end comprising a second strut, each of the first and second strut coupled to and extend away from the second longitudinal strut towards and terminally coupled to the first longitudinal strut wherein the first and second strut comprise converging longitudinal axes; wherein a first side of a second opening comprising the next opening in the sequence adjacent the first opening is generally linear, parallel and adjacent the first longitudinal strut, the first side comprising a distal end and a proximal end, the distal end comprising the second strut and the proximal end comprising a third strut, the third strut coupled to and extend away from the first longitudinal strut towards and terminally coupled to the second longitudinal strut wherein the second and third strut comprise converging longitudinal axes; and wherein the implant further comprises a bore extending from an exterior surface of the proximal end into the inner region. 112. A sacroiliac joint navigation and implant system configured to provide functional surgical guidance to an operator during a sacroiliac joint fusion procedure on a patient having a sacroiliac joint comprising a sacrum and an ilium, the system comprising: a) a joint implant comprising an electrode and a body including a distal end and a proximal end opposite the distal end, the electrode supported on the implant; b) a delivery tool comprising an implant arm including a distal end configured to releasably couple to the body of the joint implant; c) a controller unit configured to cause the electrode to emit a predetermined amount of energy; d) a data acquisition system comprising a second electrode, signal conditioning circuitry and a processing unit wherein the data acquisition system is configured to receive energy via the second electrode, convert physical parameters caused by the electrode to an electrical signal operable to enable the processing unit to process the signal to provide data comprising a relative location of the implant; e) a first electrical conductor pathway extending from the electrode along the joint implant and implant arm to the controller unit, the first electrical conductor pathway placing the electrode and controller unit in electrical communication; and f) a second electrical conductor pathway extending from the second electrode to the data acquisition system, the second electrical conductor pathway placing the second electrode, the signal conditioning circuitry, and the processing unit in electrical communication with one another, wherein the joint implant further comprises a length disposed between the distal and proximal ends; an inner portion of the joint implant; at least first, second, and third sides, each of the first, second, and third sides extending between the distal and proximal ends; each of the first, second, and third sides comprising a plurality of struts defining a pattern of openings extending between groups of multiple struts of the plurality of struts, the openings extending into the inner portion; wherein the first side is separated from the second side by a first junction, the second side is separated from the third side by a second junction, each the first and second junctions extending the length, wherein the implant further comprises a first junction having a first longitudinal strut and a second junction having a second longitudinal strut, each of the first and second longitudinal struts extending generally uninterrupted and generally parallel to one another along the length; wherein the plurality of struts defining a pattern of openings through the second side comprises a strut arrangement spaced along the length of the implant comprising repeating diagonal struts such that the diagonal struts extend at an angle between both the distal and proximal ends of the implant and the first and second longitudinal struts; wherein the implant further comprises a window extending into the inner portion substantially perpendicular to an extension of the openings comprising the pattern of openings, and wherein the window comprises a perimeter which is substantially larger than the openings comprising the pattern of openings, the window and openings comprising different shapes; and wherein the implant further comprises a first keel and second keel each coupled to the implant and each extending along the length between the distal and proximal ends of the implant, the first keel extending generally perpendicular to the length in a first direction and the second keel extending generally perpendicular to the length in a second direction generally opposite the first direction. 113. The system of claim 112, wherein the inner portion of the implant comprises a lattice structure of material.